Playing background. Coach Buckley is a native of Wayne, Pennsylvania, outside of Philadelphia, where he attended Conestoga High School. Clay played varsity basketball for four years, became the School’s all time leading scorer and rebounder, and was subsequently elected in the inaugural class of his High School Athletic Hall of Fame. Coach Buckley then attended Duke University under a full athletic scholarship. 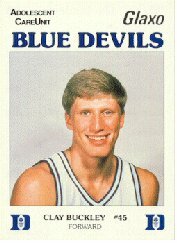 During Clay’s tenure at Duke, he became one of only 4 players in the history of Division 1 Men’s basketball to go to 4 Final Fours. He was co-captain of the team his Senior year when the team won the National Championship defeating then undefeated and returning champion UNLV in the semi-finals and Kansas in the final game. Coach Buckley went on to play professional basketball for a brief stint in Pergamino, Argentina, after which he resolved himself to playing in old men’s leagues, which he continues to do today. Coaching experience. Coach Buckley has taught and/or spoken at numerous camps throughout the years, but began coaching in earnest in the McLean Youth League when his son Fletcher first became old enough to play. He has continued to coach his children in the McLean Youth League over the last 5 years. In 2008, Coach Buckley joined the McLean Select Basketball program, guiding his 10U team to the regular season championship. Clay was a Coach of the Year for McLean Select Basketball, sharing the girls’ coaching honors with fellow Matrix coach Brian McNicoll. During the 2009-2010 season, Coach Buckley coached the McLean 10U Division 1 team and was named Girls' 10-Under Division 1 FCYBL Most Valuable Coach by his peers. For the 2010-2011 season, Coach Buckley is coaching the McLean Select 11-Under Division 1 team. The team was the champion of the 2010 BRYC 11-Under Division 1 Thanksgiving Tournament. Clay was again named the FCYBL Most Valuable Coach by his peers in 2010-2011. He is currently the head coach of the McLean Select 7th Grade Division 1 team. Coach Buckley joined the Matrix coaching staff in 2009, serving as the assistant for the 9U Green team. In 2010, he moved up with the team and took over the head coaching position for the 10U Green team. The 10U Green team earned the bronze medal at the 10-Under Division II Potomac Valley AAU District Qualiftying Tournament. In 2011, Coach Buckley led the Matrix 2017 Green team to the Potomac Valley 11U-Division 1 gold medal. He looks forward to continuing that team's success in 2012. Coaching Philosophy. Coach Buckley has two rules for his team to follow while playing…..Try Hard and Have Fun. He employs much of the techniques and philosophy that he picked up at Duke (e.g. man-to-man defense focus), but adjusted to be digestible and fun for the kids. Winning is important (as Coach K has said, “there is no such thing as a good loss”), but pales in comparison with the objective of developing the skills and teamwork to have these young ladies prepared for play at the next levels. Personal Background: Coach Buckley is a 11-year resident of McLean, Virginia, where he lives with his wife, Kerry, and two children, Fletcher and Ellie. Clay is a sports fanatic, and enjoys playing basketball and golf in his leisure time. He is very passionate about coaching, and enjoys imparting his knowledge on the children immensely. Coach Buckley can be reached by email at .